1. A steady persistence in adhering to a course of action, a belief, or a purpose; steadfastness: Endurance and perseverance, when combined, can result in a successful endeavor. 2. The determined continuation with something; usually over a long period; especially, despite difficulties or setbacks: Perseverance usually indicates that something has been continued in spite of it not being easy to accomplish; in fact, perseverance is required to accomplish just about any skill. 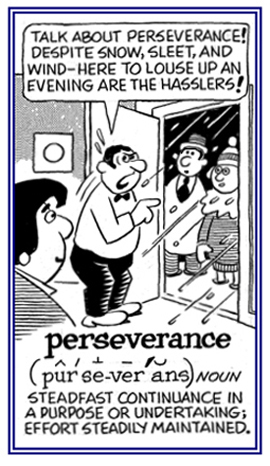 Perseverance may be used in either a favorable or an unfavorable sense, and implies unremitting and sometimes annoying persistence; for example, talking when others want to study. 3. 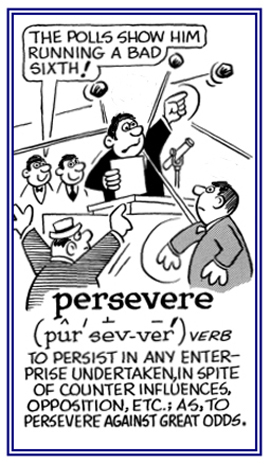 Etymology: from Latin perseverantia, "steadfastness, constancy". © ALL rights are reserved. Motto on the seal of the State of Virginia, USA. Constant in pursuit of an undertaking. Perseverance succeeds [overcomes or conquers]. —John D. Rockefeller (1839-1937), American industrialist, philanthropist.